February 5, 2019 - Tertiary enrollments for mining engineering students have been in decline for six years as the industry has struggled to attract young talent, according to the Minerals Council of Australia (MCA). The current crop of around 300 mining engineers that graduated from Australian universities is expected to fall to just 50 by 2022. Warnings of an impending skills shortage in the mining and resources industries have prompted a response from suppliers who are rising to meet the challenge. One way to deal with this potential problem is through the democratisation of skill sets through ever-improving technology. Komatsu’s latest dozer, the D375Ai-8, provides a way to fill a skills gap for operators in this regard. The company celebrated the 72.9-tonne dozer’s Australian launch at an event in Brisbane last November, and has big plans for the machine in 2019. 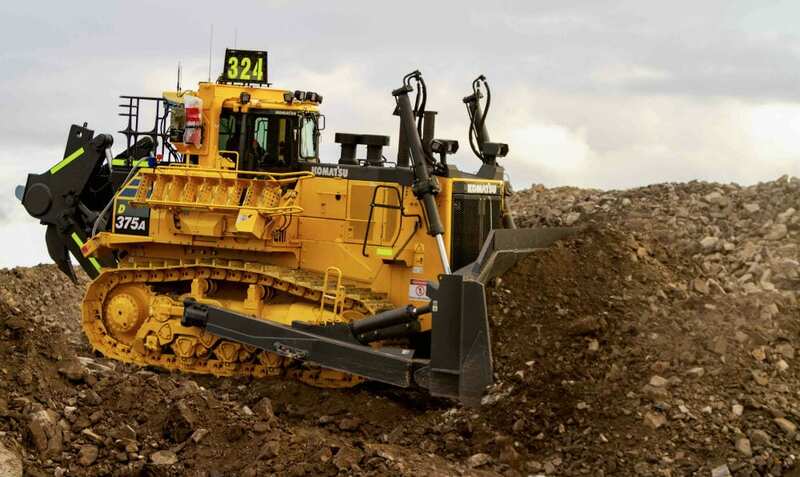 “It’s all part of the progress towards fully autonomous dozers and I think the timing is extremely fortuitous,” Komatsu Australia mining product manager Michael Hall tells Australian Mining. The Ai-8 boasts a SAA6D170E-7 Tier 4 diesel engine, which incorporates features to substantially reduce particulate matter and other emissions compared with previous generation engines. It also reduces fuel consumption through a heavy duty EGR (exhaust gas recirculation) system, a hydraulically driven radiator cooling fan and Komatsu’s auto idle stop system. It is rated at 455 kilowatts in forward and 558 kilowatts in reverse, a capacity that helps to reduce cycle times and bank cubic metre costs during downhill dozing runs, considered the most efficient method of bulk dozing. Compared to its predecessor, the D375A-6, engine power has also been increased by 20 per cent when reversing, resulting in an 18 per cent boost to downhill dozing production. Fuel consumption has also been reduced by up to 10 per cent due to the inclusion of an automatic gearshift transmission that selects the optimal gear range to meet the needs of the machine. “Komatsu dozers have long been recognised for their high performance pushing and ripping capability, with Dash 1 generation dozers still in service, in Australia, New Zealand and around the world,” Hall says. While it shares the same engine under the hood as the A-8, the Ai-8 builds on that model’s success with an increased focus on ease of use and efficiency through the incorporation of several automated systems, including a fully automated dozer blade. This blade is designed to be able to cut to within 300 millimetres of final design surface, at which point the machine automatically switches to fine blade control to whittle the surface down to within 50 millimeters over or under the surface. This allows the operator to concentrate on directional movement without becoming overloaded by the controls. This also includes auto blade pitch and auto ripper stow, as well as carrying over the automatic transmission and lockup torque conversion of the A-6 series. Real-time operational analysis is available from the operator’s dash and can be sent to the site office via standard 3G and 4G communication networks in order to check progress against plans and allow for near-real-time adjustments as required. This includes Komtrax Plus integration for equipment monitoring. A report can be delivered remotely based on a machine’s operating data, which further boosts productivity and lowers fuel consumption. “The ‘Ai’ can also be referred to as intelligent machine control (iMC). It’s all about accuracy, mining to plan, and getting the feedback so you can see what’s happening on a near real-time basis,” Hall explains. These quality-of-life improvements extend to the design of the cabin itself, which offers improved visibility over previous models. The A-8/Ai-8 allows operators to see the tip of the ripper, which means they can see where it is put in the ground. The corner tips of the blade are also visible from the operator’s seat. Cabin glass has been made longer and engine cowling narrower to further improve visibility. “The skills shortage is what iMC is targeted at; it’s about being able to have the technology on the machine so that you don’t need those highly skilled 20-year veterans to get the kind of production that you require,” Hall adds. This is particularly handy for applications such as coal mining when cutting the final layer of overburden as it allows operators to see if they are cutting into an interburden seam, waste material or the coal itself. This also helps during mine rehabilitation works, where the accuracy of profile dozing is of the utmost importance. Already noted in the mining industry for its expertise with driverless haul trucks through its autonomous haulage system (AHS), the Ai-8 represents Komatsu’s largest step yet towards its ambitious realisation of the fully autonomous dozer. “Komatsu has been making haul trucks move autonomously for over 20 years, and the mining products we’re seeing being released now are a culmination of the development of other products and a true stepping stone towards fully autonomous machines,” Hall concludes.